Why would you play Blackjack with a live online dealer? What is Black Jack: Blackjack is one of the oldest card games around, it is also called 21, and it is a simple game at heart. A group of players sit around a table and try to beat the dealer. The player’s hands are scored and the aim of the game is to get to 21 without going over. Whoever is closest to 21 at the end of a hand, wins. If you have ever played live casino Blackjack then you will already know how to play live casino Blackjack online. The rules of the card game are the same and you can slot right into a table. The online version with a live dealer just gives you the ability to play from anywhere, at any time and with anyone. bet. The dealer will deal you into the next hand and away you go. If you have not played Blackjack before you will need to know the rules before you join a live casino Blackjack game. Numbered cards – It is their face value. Picture cards – Are all worth 10. The Ace – Can be either 1 or 11, you get to choose. So if you have a hand which has a 5 and a Queen in it, your hand is worth 15. If you have an Ace and a 2, your hand could be worth either 13 or 3. Once you have placed a bet and received your first two cards, you get to look at them and decide what to do next. You should look at what the dealer has, one of their cards will be face up to give you a helping hand. If you have a low total, you can ask for more cards to try and get your hand up to 21. All the new cards score in the same way and add to your total. Be careful not to ask for too many extra cards, as if you go over 21, you are bust and lose the hand and your bet. Hit – This gives you another card. Stand or Stick – You stop getting any more cards and ‘stick’ on your total. Double – You double your bet and will only receive one more card. Split – You can ‘split’ two cards of equal value and create two hands to play. 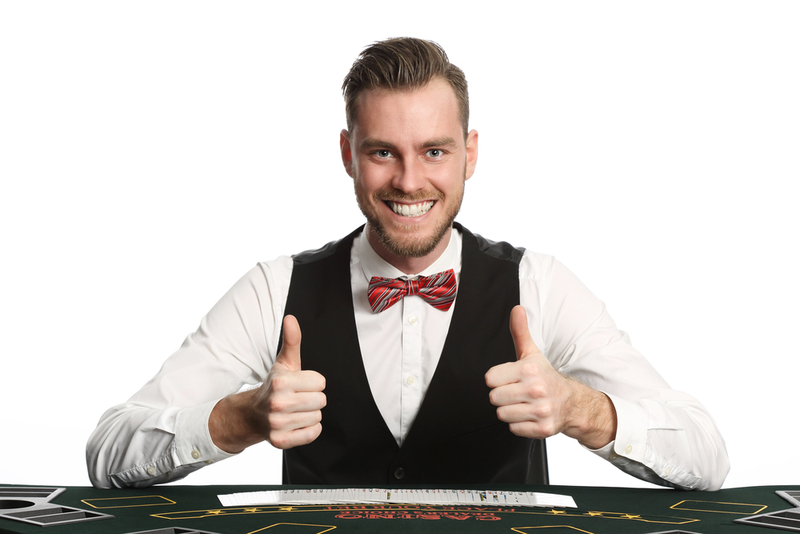 The nice thing about playing live Blackjack online around a table, is that you are not playing against the other players and all of you can win, if you beat the dealer. The only hand you have to try and beat is that dealer’s hand in front of you. The best hand in Blackjack is Blackjack itself. This is an Ace a picture card. The total is 21 and it can not be beaten. The tables have a special payout rate for this hand and all casinos will pay for Blackjacks at 3:2. The second best hand is any other combination of 21. It could be an Ace and a 10, or a 7, 4 and a 10. It doesn’t matter how you make it up, but as long as you get there. From then on, the best hand is simply the highest hand on the table. You are playing a live card game and you get to see real cards being played with. It helps to create the right atmosphere for your playing experience. You can sit and watch everything that is going on. When you are sat playing at a live dealer table, you will sit and chat to the dealer all night long. The exact same is true of the online live tables. You will be able to play your games whilst having a chat with the dealer. It is really easy for the online casinos to be able to credit you for your playing time. They can see if you have played twenty hands and can give you an individual bonus, or the dealer might be able to give you a free promotion just for being a good player. If you are on a table of seven players, it only takes one to slow play and your hand will take a long time. There’s a simple solution to this, you can move tables at the click of a button to a quieter one. Just like any real-life casino, the online live tables have a set capacity. Once all the tables are at capacity, there are no spaces left for you. The good thing about the online version, is that players tend to move around quite often, so it will never be long before you can find a seat. Playing Blackjack online at a live dealer table is the closest you will ever get to having the live casino experience while being able to play from the comfort of your own home.